ReLeaf Shop is a Baltimore Medical Marijuana Dispensary ReLeaf is a medical cannabis dispensary located in Mount Vernon, Baltimore. At ReLeaf Shop, Midtown patients have access to cannabis products of the highest quality provided with premier customer service. ReLeaf is steeped in medicine, founded and operated by medical professionals dedicated to enhancing patient quality of life through holistic medicine. ReLeaf’s mission is to enrich the cannabis community, as well as progress and normalize medical marijuana through safe and compliant practices. History and Staff With a robust background in medicine, ReLeaf’s team provides education and insight few other medical marijuana dispensaries can. One of ReLeaf’s founders was a Professor of Medicine at Johns Hopkins, an officer for the FDA, and a veteran who has been a leading researcher in Drug Development for over 40 years. ReLeaf’s other co-founders are just as impressive and well-versed. One, a pharmacist with a compounding background, the other specializing in oncology pain and surgical equipment sales, and the last has operated retail stores in over 11 states. Together, the four have combined their experience and passion for helping the cannabis community to establish ReLeaf. Today, the team is overjoyed at the opportunity to make a difference in patient’s lives throughout Baltimore. Menu With ReLeaf’s large selection, every patient is sure to find the perfect medical cannabis product to fit their lifestyle. All products carried by ReLeaf are sourced from suppliers approved by the state of Maryland and lab tested. Baltimore patients will be able to find high-quality smoking and vaping accessories at ReLeaf, too. 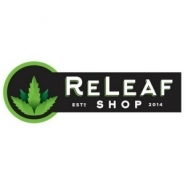 Thanks to ReLeaf’s fantastic selection of cannabis products and accessories this dispensary is Baltimore’s one-stop-shop for all your cannabis needs. Service Locations ReLeaf Shop is located in Mount Vernon, and the team is happy to offer their medical cannabis products and service to patients throughout Baltimore. Medical marijuana patients in Midtown, Fells Point or Hampden are invited to check out ReLeaf Shop for their medical cannabis needs. Canton, Inner Harbor, and Sandtown-Westchester residents will find high-quality medical marijuana at ReLeaf. The compassionate budtenders at ReLeaf are happy to assist patients from Cherry Hill, Locust Point, and Federal Hill. Location Information Baltimore is rich in American history and has served as a vital seaport for more than 200 years. Fort McHenry is the site where the U.S. National Anthem, “The Star-Spangled Banner” was composed, and today is home to shops and high-end crab shacks. Baltimore offers a wide range of landmarks to visit and activities to enjoy. Visitors and residents can pay a visit to Walters Art Museum, the Washington Monument, listen to the Symphony Orchestra, or check out the Peabody Institute. Veterans ALWAYS 22% off. Seniors ALWAYS 15% off. Monday - All High CBD Products 20% off - Flower, Vape, AND R.S.O. Tuesday - TRIVIA TUESDAY Free Gram for qualified patients that answer the quesiton of the day! Wednesday - 25% off Strain of the Day Thursday - 20% Off Tablets and Tinctures Friday - 25% Off Elixirs, Syringes, and Balms Saturday - SHATTERDAY 25% off Shatter Sunday - 25% off Strain of the Day Free Parking Everyday!